GOODYEAR, Ariz. (Sept. 26, 2017) – Maracay Homes is celebrating the grand opening of Cottages at Rio Paseo, a highly anticipated, 93-home neighborhood located within walking distance of Goodyear, Arizona’s top shopping and dining district, Saturday, Oct. 7. Cottages will feature homes that will be registered with the U.S. Green Building Council, a third-party rating system that verifies compliance across several areas addressing sustainability, with the goal of earning the LEED® Certified designation. Designed to use 30 – 50 percent less energy than typical homes, Maracay’s Homes at Rio Paseo will meet the EPA’s Indoor airPLUS specifications, and will feature water-efficient fixtures, LED lighting, energy-efficient heating and cooling systems, Energy Star® appliances, tankless water heaters and Wi-Fi enabled, programmable thermostats. The grand opening event will include a neighborhood gathering from noon – 3 p.m., featuring a barbecue lunch with dessert and refreshments. Potential homebuyers are encouraged to attend the event, where they will have a chance to meet Maracay’s New Home Advisors, tour the new, beautifully-appointed model homes and learn about all of the neighborhood amenities. Situated on West Encanto Boulevard, north of Interstate 10, Cottages at Rio Paseo offers residents “life within walking distance,” as it not only neighbors Goodyear’s top shopping and dining district, but also lies near an array of entertainment and outdoor recreation opportunities and the highly rated Litchfield Elementary School District and Agua Fria Union High School District. Several high-performing charter and private schools are also nearby as options. 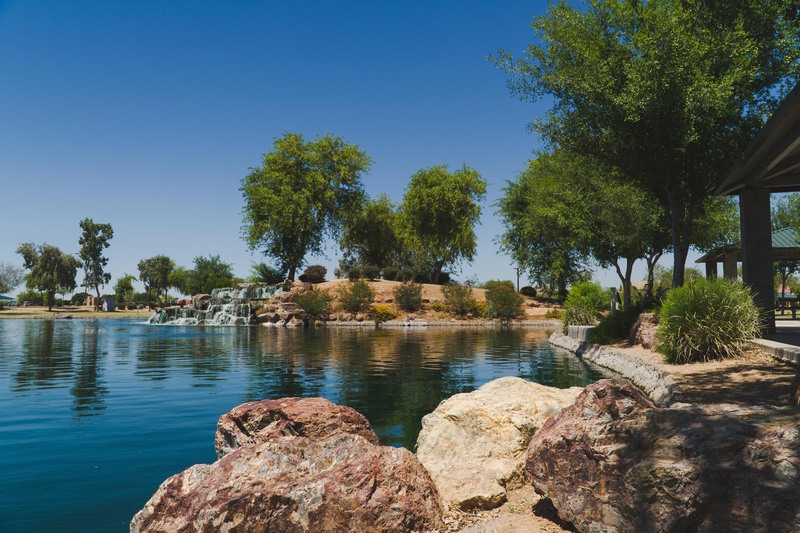 Additionally, the neighboring 14-acre Rio Paseo Park features a beautiful waterfall pond, walking and jogging paths, and barbecue grills. Residents will also enjoy easy access to Sky Harbor International Airport, Luke Air Force Base and Phoenix-area amenities. Originally developed prior to the recession, Rio Paseo fell dormant during the housing downturn. Maracay created an all-new series of floor plans designed to appeal to the unique preferences of today’s Millennials, Gen-Xers and Baby Boomers, who prefer open concept, indoor-outdoor living and contemporary finishes. Maracay also is revitalizing Rio Paseo’s grounds and amenities, including adding premium playground and pool equipment, complementing the landscape with beautifully-appointed furniture, modernizing the exterior color schemes to match interior designs, and much more. Ranging from 1,674 to 1,929 square feet and priced from the mid $200,000s, the floor plans will provide affordable, single-family detached homes below the FHA loan limits while at the same time, featuring spacious great rooms, walk-in kitchen pantries and indoor-outdoor living. Maracay’s Rio Paseo Cottages will also offer FlexDesign® options tailored to meet each family’s individual needs. All homes are Energy Star® certified and registered with the certification goal of LEED Certified® standards from the U.S. Green Building Council. The homes also include Maracay Homes’ Living Smart® program for high performance and energy efficiency. In addition to Cottages, Maracay is also unveiling 117 condominiums later this fall with the opening of Villages at Rio Paseo. For more information on Cottages and Villages at Rio Paseo, please contact Maracay Homes New Home Specialist Pam Meyer at (480) 889-3713 or visit www.MaracayHomes.com. For more than 25 years, Maracay Homes has been a leader in the Arizona real estate industry, providing homebuyers with smarter choices that serve both their lifestyle and the environment, while constructing more than 9,000 homes for families throughout Phoenix and Tucson. Maracay Homes’ exclusive FlexDesign® program gives homebuyers the unique ability to tailor their new home to the life they want to live. The company’s Energy Star® and LEED® certified homes feature the latest generation of high-efficiency technologies and sustainable building materials and practices, and the LivingSmart® program continues this comprehensive approach to green living. Maracay Homes has earned numerous awards including the 2017 NationalsSM Silver Award by the National Association of Home Builders, back-to-back Major Achievements in Merchandising Excellence (MAME) Awards by the Homebuilders Association of Central Arizona in 2016 and 2017, and was previously named Builder of the Year by the Southern Arizona Home Builders Association (SAHBA). Maracay Homes is a member of TRI Pointe Group® (NYSE: TPH), a family of premium regional homebuilders. For more information about Maracay Homes, please visit www.MaracayHomes.com.